Positions in the NSW Rural Fire Service (NSW RFS) are advertised on the NSW Government Jobs website. In addition, rural positions may be advertised in rural newspapers as required. What type of work is available in the NSW RFS? 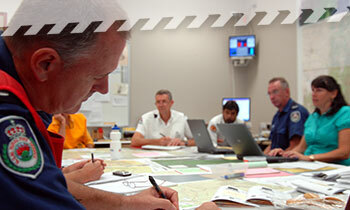 The NSW RFS is located in over 150 centres right across NSW. The majority of these centres are located in Districts. However, we have four Regional Offices (North, South, East and West), three Customer Service Centres (Glendenning, Coffs Harbour and Batemans Bay) and Operational and Mitigation Services bases plus our Headquarters at Lidcombe. For further information on employment with the NSW RFS see the Information for Employment brochure or contact the Membership Coordination Unit by email mcu@rfs.nsw.gov.au or telephone 02 8741 5236. You may also consider joining your local Rural Fire Brigade as a volunteer member.